It sees the heat of their bodies. It smells their fears. It hunts for sport. It kills for pleasure. In a place without rules - the hunter has become the hunted. 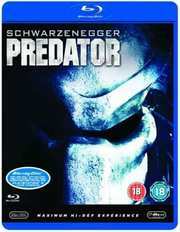 Deep inside the jungles of Latin America Schwarzenegger's team of elite commandos are being slaughtered by a mysterious predator. No longer are they hunters - they are the prey... of an alien whose only instinct is to kill. One by one it strikes with inhuman ferocity. Now to survive with the jungle as their only ally they face their greatest challenge: to stay alive.